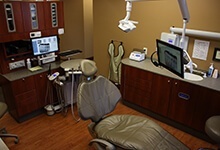 At Family Dental Care, we’re serious about using the latest technology to make your experience a pleasant one. We’ve invested heavily in tools that reduce discomfort, speed dental procedures and generally make receiving dental treatment comfortable. Our exam rooms are equipped with televisions and DVD players, cable access and headphones. Children love the opportunity to watch something they enjoy and sometimes even forget they are in a dentists office. 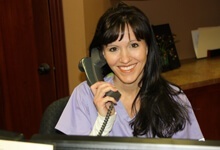 Even our adult patients would agree it’s a great, relaxing option for longer procedures. Nitrous oxide is also available. 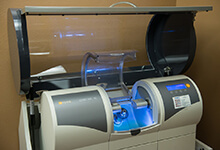 Family Dental Care has invested over $100,000 in a state-of-the-art sterilization center. 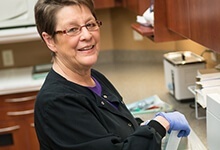 Bonnie, our sterilization specialist makes certain our patients have a safe and sterile experience. 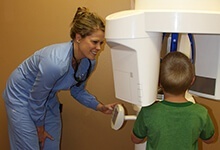 All of our x rays are digital and emit only a low does of radiation; up to 80% lower than traditional x ray machines. Digital x rays are immediately available and they give us flexibility to enhance or enlarge the image to better understand what we’re seeing. X rays with greater accuracy. While traditional x rays are used to detect cavities and look only at your teeth, a Panorex x ray provides a panoramic view of your oral cavity. With the use of our Panorex and 3-D Panorex x ray we are able to diagnose and treat patients safely and accurately. These images allow us to detect problems with your jaw, early signs of oral cancer, or sinus problems, and help us to more adequately prepare for, root canals, oral surgery and dental implants. Our x ray options also offer a more comfortable experience for those who have difficulty with the the hard-to-swallow x rays. Non surgical soft tissue laser treatments. Gum Disease is an epidemic in the US today, and it often leads to more serious problems like heart disease and premature birth. Shocking as it seems, gum disease now affects nearly 3 out of every 4 Americans. When early signs of the disease are ignored, the consequences are especially dire, eventually leading to the loss of your teeth. 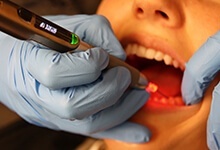 Soft tissue laser dentistry has proven to be considerably less painful and much faster healing than hold fashioned “cut and stitch” surgery. 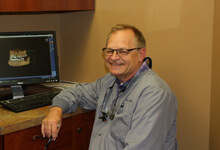 With our investment in a CEREC we can take care of a crown in a single visit. We create the restoration right in our office. Digital imaging ensures it’s the correct color and fit. The restorations are natural feeling, durable and long lasting. With our Isolite mouth pieces we achieve better visibility and moisture control, resulting in improved efficiency, clinical results, safety and most importantly patient comfort. All of our dentists and hygienists wear surgical magnifying loupes to allow us to provide the most comfortable and thorough care possible.